Step 2: Click on “File–> Info–> Account Settings” to open account settings window. Step 3: Click on “New” button. Step 4: Tick the checkbox for “Manual setup or additional server types” and then click on “Next”. Step 5: Select IMAP/POP from the list of options. Step 8: Check the “Remember Password” box and then click on “More Settings”. Step 10: Check “My outgoing server (SMTP) requires authentication” box when “Outgoing Server” tab is visible. Step 12: Click “OK” button. Step 13: If everything you entered is correct then you can get one congratulations message, close it then you can use your AOL account through Outlook. The issue with the manual method to migrate AOL mail to Outlook is that it is possible for a few amount of emails. In case of the bulk transaction, it does not work. Another shortcoming of this procedure is the user must have some technical knowledge of IMAP/POP3 settings. To overcome the above-mentioned shortcomings you can use a third-party tool like SysTools AOL Backup which can easily transfer AOL folders to Outlook. By using this approach you can also prevent the wastage of time and effort in large amounts. 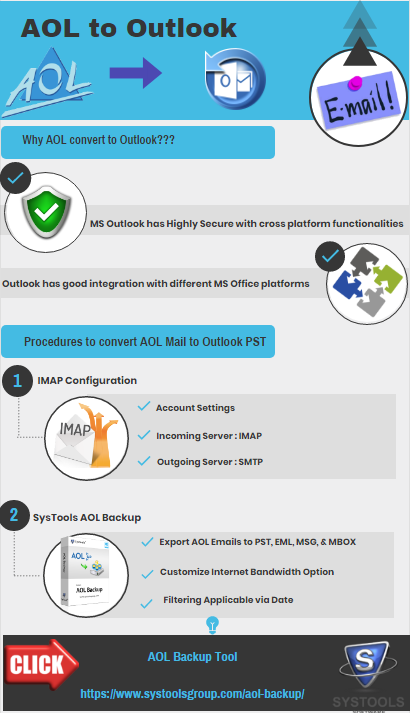 From this write-up, we can conclude that the query how to export AOL mail to Outlook have more searches due to the great unique functionalities of Outlook. Most of the users prefer to use automated solution instead of using manual one, because of its shortcomings. So to get the perfect solution within a small span f time you can directly choose AOL backup tool mentioned here.